Name meaning 'spotted', reffering to the colouration of the flowers. Tropical forests, up to 1000-1500 m. In China I have seen many growing on steep limestone mountains where they sometimes dominate and colour whole patches of mountainside white. In gneral quite common in Xishuangbanna's seasonal forests. Currently cultivated across the tropics. Ornamental. In Xishuangbanna the flowers are eaten, and they taste OK to me. Acetone and methanol bark extracts of Bauhinia variegata has shown activity against some medically important bacterial strains. It is also used to cure asthma and ulcers. The buds and roots are good for digestive problems. From Pakistan and India to South China and Burma to Vietnam, Cambodia, Laos, Cambodia and Thailand. 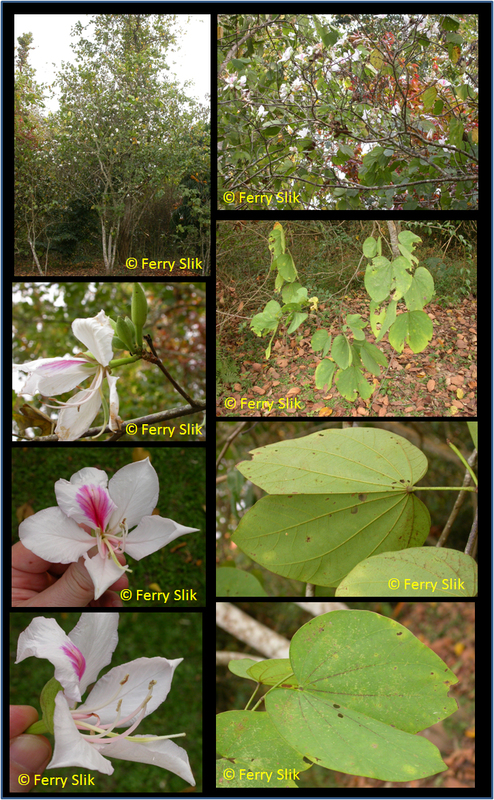 English: Camel's foot tree, Mountain ebony, Orchid tree. India: Kachnar (Hindi), Kanchan (Bengali).